New faculty member will begin in July 2019! Stacey Cunningham ’96 will be presented with the Distinguished Alumni Award for Excellence in Industry at the ISE Annual Banquet. Three student teams presented at the ISE Department Undergraduate and Master's Research Symposium on January 24, 2019. ISE Professor compiles weekly OR, math, computing, and logic puzzles into book. As VP of meetings, ISE professor will oversee conferences for leading association of operations research and analytics professionals. Students develop an app, called MS Together, that helps multiple sclerosis patients connect with each other and share their stories. David Morency ’18, first Lehigh student to receive award, will begin graduate studies in China in August 2019. Thinking manufacturing? Think again, and think bigger. ISE is distinctive because its tools can be applied to any business in any setting, from production to services, in either the private or public sector. Industrial and systems engineers design, improve, and optimize processes, systems, or the products and services themselves. In today’s competitive marketplace where continuous improvement and cost containment are paramount to survival, this is an extremely critical role. That is why our graduates are so sought-after. To purchase reservations or learn more about the 2019 ISE Banquet, click here. Lehigh ISE is ranked #17 in Industrial/ Manufacturing/ Systems Engineering (Best Grad Schools, among 92). 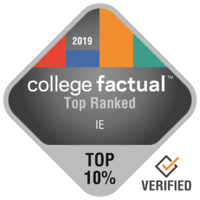 Lehigh ISE is ranked #5 Best Industrial Engineering Colleges in the US (among 86). Lehigh ISE is ranked #2 Highest Paid Grads in Industrial Engineering in the US (among 86).